"Many PC-replacement-products made from acrylic, polystyrene, polyethersulfone, and Tritan resins leached chemicals with [estrogenic activity], including products made for use by babies. Exposure to various forms of UV radiation often increased the leaching of chemicals with estrogenic activity," write the study authors. The conclusion of the study will send shockwaves across the baby products industry, stunning many parents who thought "BPA-free" meant "free from all hormone-disrupting chemicals." Many BPA-free PC- replacement products still leached chemicals having significant levels of estrogenic activity, as did BPA-containing PC counterparts they were meant to replace. That is, BPA-free did not mean [free from estrogenic activity]. An article published by Mother Jones (2) reports the research, revealing that ultraviolet rays (UV) activate and "unlock" hormone-mimicking chemicals in BPA-free bottles made out of polyester (PES) and Tritan, the materials most commonly used in BPA-free bottles. Over the last several years, the negative press about the hormone-disrupting properties of BPA (Bisphenol-A) led to a wave of new "BPA-free" baby bottles, water bottles and sippy cups. 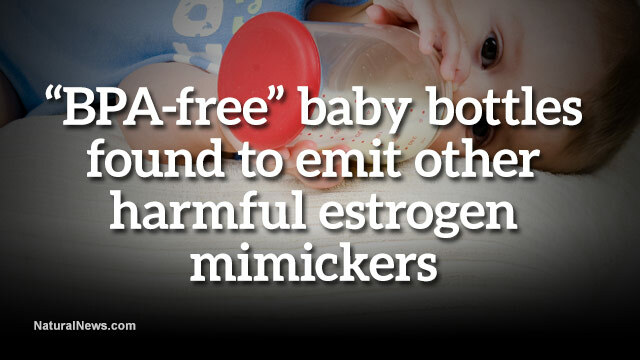 But just because a bottle is free of BPA doesn't means it's free of other hormone-disrupting chemicals. "Many of the items above are advertised as healthy alternatives to plastics containing BPA and the hormone-altering chemicals known as phthalates," writes Mother Jones. "Born Free markets its baby products as the 'natural choice for moms who want a safe, calm experience every time they feed their baby.' Weil Baby claims that its bottles are made from 'revolutionary new materials' that are 'ultra-safe.' After UV exposure, CertiChem's study found that both companies' products leached potent synthetic estrogens." UV rays are not only found in sunlight; they're also used by parents to sanitize battle bottles (UV light exposure kills bacteria). According to this research, the very process that parents use to sanitize baby bottles may be releasing hormone-disrupting chemicals that harm their babies. What's wrong with BPA and other hormone-disrupting chemicals? They're linked to cancer, for starters. Even at tiny doses -- just parts per billion -- they may cause infertility problems, liver abnormalities, asthma and heart disease, according to scientists. Even worse, some of these effects appear to be epigenetic and trans-generational, meaning they pass from one generation to the next. So a young mother who feeds her baby with baby bottles containing hormone-disrupting chemicals is not merely potentially harming her own baby; she's may be harming her baby's future babies as well, down through an unknown number of generations. BPA-free isn't good enough: TOPAS and ZEONOR polymers are the new "green"
This research also revealed that two brand-name copolymers named TOPAS and ZEONOR showed no signs of hormone-disrupting estrogenic activity, even when exposed to UV rays. TOPAS and ZEONOR are "cyclic olefin polymers" or copolymers developed by materials scientists in Germany and Japan. They are both very expensive compared to the lower costs of Tritan and PES. To my knowledge, there are currently no baby bottles or water bottles available which are manufactured out of TOPAS or ZEONOR. Interestingly, Nalgene green bottles made out of Tritan tested negative for estrogenic activity after exposure to UV rays, most likely due to the green dye acting as a kind of internal UV block. So if you're looking for a plastic water bottle that's available right now and shows no estrogenic activity, a green Nalgene bottle seems to be the way to go, based on this research. This research opens up a tremendous market opportunity for someone enterprising enough to introduce baby bottles and water bottles made out of cyclic olefin copolymers (COP or COC). It might turn out to be the world's most expensive water bottle ever, but there's a huge demand for containers that don't leach toxic chemicals into the liquids they're holding. If anyone reading this is seriously looking into launching COP or COC-based bottles, please contact us here at Natural News so we can help support your product launch.